Cost to paint the whole house varies greatly by region (and even by zip code). Get free estimates from painters in your city. Cost to paint the whole house varies greatly by region (and even by zip code). The average price of painting a home interior is $6,900. Type of paint: higher quality paints will cost more. Number of coats: some colors will require multiple coats of paint. Texture of the walls: highly textured walls may require special equipment, which can raise costs. Condition of the walls: painters may patch holes, remove wallpaper, or put up drywall 1 before painting, all of which can impact costs. Room being painted: some rooms cost more to paint than others, with factors like trim, windows, and furniture playing a role. Complexity of the work: murals, faux finishes, high ceilings, and other complex jobs can impact the cost. One of the benefits of painting an entire home interior at once is the ability to create a “color story” or plan the way that the color will flow from room to room, and how to best complement each space with the color of the walls. Flat or Matte: a completely matte paint with no sheen or reflection. This can make the paint hard to keep clean. 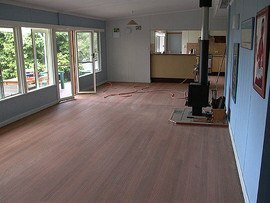 Eggshell: eggshell has very little sheen, but with more luster than flat. It works well at hiding imperfections on the walls. Satin: satin paint is the most common, everyday paint. It has a low luster, but is easier to clean than eggshell or flat. Semi-gloss: semi-gloss is usually used in high traffic areas like kitchens, because it’s easier to keep clean. This paint has a fairly glossy, reflective finish. High-gloss: high-gloss paint is very reflective. It’s normally reserved for trim, moldings, and doors. You may want to have your trim, windows, and doors painted at the same time. This will add an additional $2 per linear foot of trim and $40 per window or door to the total. You may also want to have your windows caulked 4, which costs around $1 extra per linear foot. If you need wallpaper removed before painting, this will increase the costs. Total costs will vary depending on the type of wallpaper and its condition, but it will likely raise costs to double what they are just for the paint job. 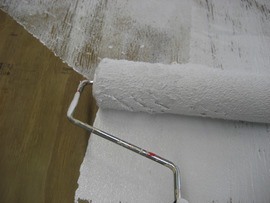 Drywall repair can also be done by the painter. If necessary, this will cost between $25 and $50 an hour, depending on the level of repair. If you have heavy furniture you are unable to remove yourself, this can be done for around $60 per room. Always buy the best quality paint you can afford, whether you DIY or hire a professional. Good quality paint lasts longer, has lower odor, and may require fewer coats. 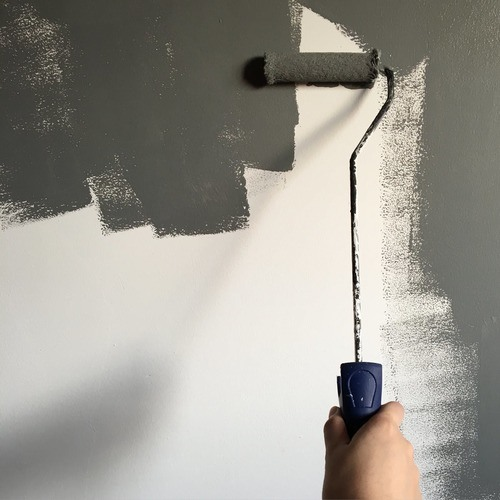 It will take more coats of paint and a higher cost to cover a dark-colored paint with a light color, and a light-colored paint with a very dark color. If you are painting before selling, stick to neutral colors that will work with most furniture colors. Interview at least three painters and get a minimum of three recent references when choosing a painter. Get the quote in writing, and make sure that they have current insurance. Make sure that your quote contains everything specified, including the brand of paint, number of coats, length of the project, and any other details. Make sure you confirm colors and details before work begins. 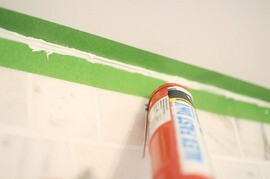 If you choose to DIY, make sure you tape off edges properly, smoothing the tape out to avoid bleeding. Cut in your edges first, then roll the interior for a smooth finish. Some painters may have a travel fee if you live outside of their range. This usually averages around $50. To save money, you can take care of some details before the painters arrive. 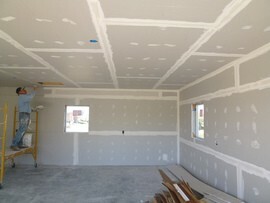 This includes moving furniture, patching holes in the drywall, and taping off the trim. How much does it cost to paint a 3 bedroom house interior? How much does it cost to paint the interior of a 2,500 square foot house? How do I paint the interior of my house? How much do painters charge per sq. ft.? How much does it cost to paint the whole house in my city? Cost to paint the whole house varies greatly by region (and even by zip code). To get free estimates from local contractors, please indicate yours. First, a summary stating the price was added and all sections were replaced with more detailed ones, including information on cost considerations, planning and colors. There is now one section explaining how to take measurements before painting a house, and another dedicated to working with an interior decorator. The section “Prep work” describes the preparation needed when painting: moving and covering furniture, cleaning the walls, etc. Sections “Primer” and “Colors” explain the different types of primers and the finishes that a color can have. There is also a section that gives prices for different projects, depending on the part of the house that is painted. There is information on how painted walls should be maintained and cleaned. There is also a section dedicated to enhancement and improvement costs and another that provides useful information about some additional considerations and costs, such as the travel fee that some professionals may charge their customers.